It seems there's a Facebook group for everything out there. One of them caught my attention when a friend highlighted it on her blog: Insecure Writers. 1. Am I really a writer? 2. Is what I'm writing good enough? 3. Will anyone want to read what I write? 1. Can I handle the marketing and still find time to write? 2. What does it mean when readers are silent? 3. Will I be able to write another book or am I a one-book wonder? In the next few Monday posts, we'll take a look at some of these questions and hopefully discuss them in the comments. Writers: What are some of the things that concern you (pre-published or published)? Readers: What does it mean when you're silent about a book you've read? Does it automatically mean you didn't like it? 1. Dena Netherton, at My Father's World, My Father's Words, gives 7 Ways to Build Your Tool Chest. This is great advice for both writers and non-writers. 2. Pamela Christian always writes unique blog posts on what Christianity is all about. She tackles the subject, "Distinctions Unique to Christianity," in her latest post. Writers: We've often talked about ways to prime the creative pump. What non-writing activity gets your ideas flowing? Readers: Do books (other than the Bible) inspire/influence your daily life? Please share. Reading is one of my favorite activities. It's not unusual for me to have 2-3 books going at the same time. I also enjoy recommending books, but the rating system of stars leaves much to be desired. While I may enjoy the story, perhaps certain aspects of a book don't sit well with me. For example: I've read stories that I loved, but they had some technical/formatting/writing issues. So...I propose that we have a two-tier system for reviews like the ice skating world. They rate skaters on their technical ability and then on their artistry. Writers and Readers: What do you think of my idea? Should I incorporate this into my book recommendations/reviews here on the blog? I'll never forget the first time I set foot in a library with my mother. Reading didn't come easily to me, so it was somewhat intimidating. With my first library card in hand, we entered the children's section and found some interesting titles. One of the books was called, "The Doll's House." It was about tiny people who lived in a child's doll house. At night, when everyone was asleep, they'd gather food crumbs and other essentials to daily living. I was totally hooked. By the time I reached sixth grade, I was reading seven books a week. I turned to bookstores and catalogs as the library ran out of titles to satisfy my voracious reading appetite. Christmas and birthday Wish Lists always included books. I longed for Christian books about kids like me. They were few and far between in those days, but the ones I found brought me closer to the Lord. 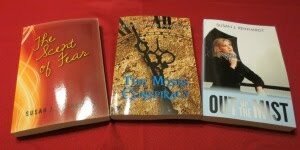 Today, parents and children have so many great Christian novels available. Libraries will often purchase books on request or borrow them from another library. Visiting the library can provide hours of FREE entertainment for youngsters and adults. Writers and Readers: Do you recall your early reading experiences? Please share. Every time I finish a book, the thought crosses my mind: Will I be able to do this again? What if I can't think of another story? Ice cream can't begin to compete with the brain freeze these questions generate. Once the pain subsides, I go back to square one. I remember how God helped me write the other books. Prayer got me over the hurdles of plot twists, getting characters out of trouble, and a host of other problems. As a seat-of-the-pants writer, my process is simple. An idea is born, and I sit down and write. One baby step after another, one word, sentence, paragraph, chapter after another. Then I type, "The End." I'm not a daredevil or risk taker by nature, so this feels rather like jumping off a cliff. Each new project requires a leap of faith. From past experience, I know everything will work out okay. Still - that first step - it's a tough one. I will get through this. I will survive. Writers: What's the toughest part of writing for you? Readers: Many situations can create anxiety. How do you get past it and take on new adventures? 1. Have you ever been asked to be a Beta reader by an author? Getting an advanced look at a manuscript is exciting, but carries with it a responsibility. Cindy Sproles guest posts at The Write Conversation and gives Beta readers some guidance on what to look for in an Advanced Reader Copy. 2. Bryan Collins guest posted at Positive Writer. I loved this article! I could see many similarities in his free writing and my Seat-of-the-Pants method. It's a great way to break through writer's block or as a warm-up for your "real" writing. 3. It gets me a little crazy when I see words misused. One of the words I see people mangle is "pique." Shanan, at The Procrastiwriter, demystifies this word and sets everyone straight on its usage. Writers: Have you experimented with free writing? Please share. Readers: Have you ever been asked to be an author's Beta reader? Did you make notes on what you liked, typos, things that confused you, etc.? Please share your experience. 1. The people would never stand for their rights being taken away. 2. Many organizations worked to protect our freedoms. 3. Our Constitution and the Bill of Rights protect us from power grabs. 1. At a recent doctor visit, he did not give me a written prescription. He said new rules were being put in place that everything had to be done electronically. His comment: "Big Brother wants to know what kind of medicines you're taking." 2. A news story came out in February that Samsung was warning voice recognition users that its software would capture all conversation and be stored. Don't have a private conversation in front of your TV or other device if it's activated. Many are comparing this to George Orwell's 1984. Soon you won't be able to have a private conversation anywhere. 3. Presidents are increasingly using Executive Orders to circumvent the legislative process. Congress is the only branch of government allowed to pass laws. This disturbing trend threatens our freedoms because it allows the Executive Branch to overrule the will of the people. It's not about politics or religion. It's about freedom - pure and simple - and affects everyone in this country.